English Blog Collection — ¡Caminemos Juntos! 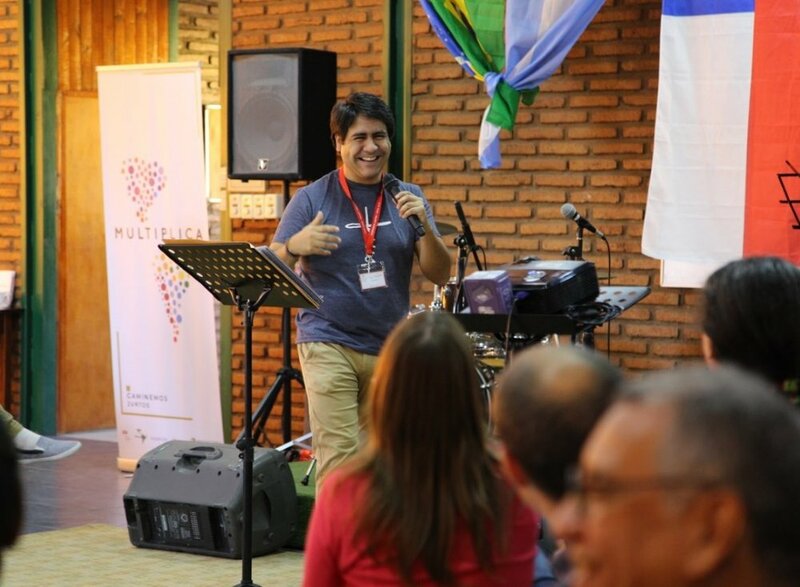 The Caminemos Juntos (Let's Walk Together) Americas Conference entitled "Multiply: New Models and Testimonies of Planting and Revitalization”, took place in Santiago de Chile, from April 3 to 6, 2019 as a gathering of around 100 leaders from more than 10 countries. 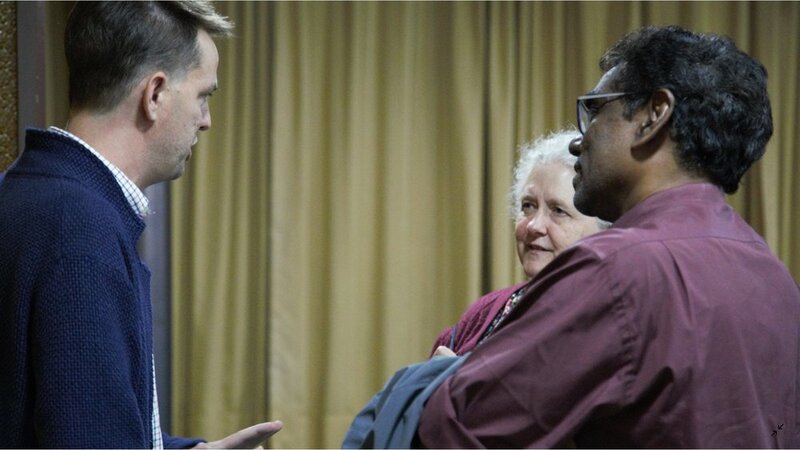 The conference was put on in partnership between the Anglican Church of Chile, the Anglican Church in Brazil, the Anglican Church in North America and the Gafcon church planting network. Also with great joy, the new album of Adoremos Juntos (United Adoration) was also released during the conference. It includes songs in English, Spanish and Portuguese which were written by latino Anglican worship leaders and songwriters from throughout the Americas at previous Caminemos Juntos conferences. You can hear the songs and download the lyrics and chords here: www.unitedadoration.com/adoremos-juntos/ These original missional songs are being sung throughout the Americas and serve to mobilize the Latino church and the global church more broadly toward mission. Two models of church planting were presented: The Spontaneous Planting Model (Brazil) and the Deep Planting Model (Chile) both offering similar characteristics regarding the required process needed. The key is to train disciples who will make new disciples. Each require time and training; prayer (including prayer walks); showing God's love in practical ways and engaging in new friendships. In summary what is required is to living a missionary lifestyle! We were encouraged to change from inviting people to church or church activities / meetings. Instead today the challenge is to meet the people where they are and start discovery bible study groups were they gather (houses, coffee shops, places of work, etc.). It's time to mobilize our churches, unleash lay leadership and boost collaborative team work. 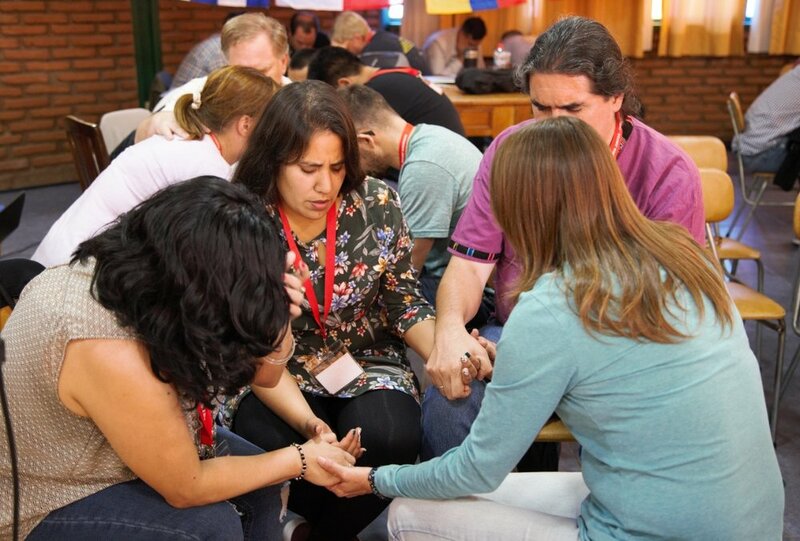 Many workshops were offered, all with a vibrant and practical focus: Equipping and Forming Leaders, Campus Ministry, Women's Ministry, Church Planting and "Semillero" / CEP (Chilean training programs). The conference ended with a communion and commissioning service. "It was a wonderful gathering where we've been taught and equipped by the Holy Spirit to revitalize God's church. We were given good tools and testimonies for church plantation. Thank God for this gift!" Andy Lenton - pastor. "Each conference of Caminemos Juntos is different, but the expectation of hearing God's voice is always the same! Each devotional, plenary meeting, workshop and time of praise and worship has been totally enriching. Sharing with brothers and sisters from different countries and learning about what God is doing is so encouraging. I can't wait for the next conference!" Adrián Torres - lay minister. "A lovely time packed with learning and sharing. We've come back renewed, inspired, with new ideas, contacts and more challenges ahead. We must continue working together as an Anglican family in unity and growth, walking together!" Andy Del Bueno - lay minister. -Bilingual (speaking and reading/writing in English and Spanish). *Most of these hours are flexible and can be done remotely. A weekly supervisor meeting in Little Village is required. Additional working hours may be available around the conference and other special events. Caminemos Juntos is a Latino church multiplication network rooted in the the Anglican Church. Our vision is to multiply Latino disciples, leaders and congregations throughout the Americas. We are excited to announce the third Caminemos Juntos: Americas conference to be held April 4-6, 2019 in Chile, South America. This conference aims to bring together leaders from throughout North, Central, South America and the Caribbean with the focus of multiplying disciples and churches throughout the 35 countries that make up these regions. The first all Americas conference was held in Chile in 2016 and the second was held in Brazil in 2017. This conference is co-led by leaders from the Anglican Church in North America (ACNA), the new Anglican Church in Brazil and the Anglican Church in Chile and will be co-sponsored by the GAFCON church planting network. Caminemos Juntos, which means, “Let’s Walk Together” in Spanish, is the GAFCON network for Latin America led by Archbishop Miguel Uchoa, Archbishop Tito Zavala, Canon William Beasley and Rev. Jonathan Kindberg. "Getting to know the family of Caminemos Juntos" is an interview project that seeks to share testimonies of some of the members of this movement, in order to promote unity and closeness among us, even through distance, and also motivate and inspire others to know a little bit more about what this mission consists of and how God has worked in it and through it. How did you connect with Walk Together? I connected through Reverend William Beasley in 2013, during the ACNA Assembly. However, it was in 2016 that I was able to participate in Caminemos Juntos in Chile, where we participated with other Brazilians. There I signed a commitment to collaborate with the movement. What motivated you to get involved and be part of this work? I found that I identified with the vision and methods of the movement, and above all, the passion to do mission among all peoples. Please tell us how the journey has been during these years, and the role changes you have had since your beginnings until now. At the beginning I participated only by receiving blessings through lectures and testimonies. Through them I also got to know people such as Reverend Jonathan Kindberg and many others from different countries. In our conversations our missionary call was evident and we saw that we could help each other. After Chile, Bishop Miguel Uchoa, who is one of the directors of Caminemos Juntos, gave me the task of helping more effectively in the movement. From there, a stronger contact began with Jonathan Kindberg and other leaders of the Americas, and we formed a group to maintain contact and periodic meetings, especially with Brazil, Colombia and Panama, strenghening our bonds of communion. In the same period I participated in the Caminemos Juntos in Chicago, and Pastor Obed Buchana, of the Anglican Christian Church of Panama, confirmed that he had no doubt that he wanted to be part of the Anglican Church and Caminemos Juntos. In turn, two pastors and churches from Colombia joined the movement. In 2017, I was already a Bishop for missions in Brazil, South America and Central America, and the ties with the Caminemos Juntos became stronger. In the same year we had the conference in Brazil, and I participated in workshops in collaboration with Jonathan Kindberg and William Beasley. As a result of this event, a group of people interested in becoming part of the movement were raised up in Brazil and I was made responsible for them. In 2018, I went to Bogotá and Panama City to officially receive the churches there into the network, and confirm new members in the Anglican Province in Brazil. These churches are the fruit of the Caminemos Juntos. In May of the same year, I was invited to minister at conferences and workshops at Caminemos Juntos in Mexico, where I had the honor of meeting a very special local leader, Bishop Mark Zimmerman, with whom I participated in the ordination of a Deacon. As you can see, our bonds of communion are strengthened along with the expansion of the movement. Today as part of the leadership, I am involved in the pastoral care, formation, dissemination and strengthening of Caminemos Juntos and its vision. What has been the most wonderful thing about serving in this movement? To be able to work with people who have the same passion for missions, to witness the fruits of what was sown with love and to learn about the cultural diversity and the different challenges of each church. Above all, to perceive the real presence of the Holy Spirit in front of this work. What has been the most difficult during these years of service? I think the distance that prevents us from being together more frequently and as well as reconciling the local work with the work of the province, because besides being responsible for a very large region in Brazil (South and Southeast) I have a local church for which I am responsible. How do you link your career in your mission and purpose? The mission is my career. How do you see yourself serving in the future? Doing what I have done so far in a more organized way, so that it can be more useful for the growth of the kingdom. What do you dream for Let's Walk Together? What I dream is already happening. That the movement and its vision are being strengthened and reaching other parts of the world as we had the opportunity to testify about at GAFCON 2018. How did you connect with Caminemos Juntos? Pastor Jonathan invited me to the Caminemos Juntos conference. He told me it could be a blessing for me, and it was. My Latino part was asleep, I was not connected to a Spanish speaking church, and I was one of the few Latinos in Church of the Resurrection. I remember that every time someone noticed this, they asked me if I had talked with Jonathan, until the day came, and I finally met him. I had grown up in a church in Spanish, but my faith, training and studies were developed in English. It was like my faith in Spanish was a boy and my faith in English was more mature. When I attended the Caminemos Juntos conference I experienced for the first time connection between my life in Spanish, and my faith, ideas and prayers in English. The reconciliation between the two worlds, which I had not experienced before, was culturally and personally healing; that opened my heart to find more about what it means to be a Latino Christian in a place where everything is in English. The conference was the beginning of the road to understanding what it meant to be a second generation Latino in the United States, and the understanding that I had a lot to offer to the Hispanic and Anglo American community. I could see the importance of what they were doing. Please tell us how the journey has been during these years, and the role changes you have had since your beginning until now. I started, in part, because there was a need for administration and organization in the Latino movement, and although I did not have that as my strongest gift, it was something I could do and was willing, so I supported Caminemos Juntos and Resurrección Church in this area. After a time of service, something typical of the character of Greenhouse happened. Little by little we realized that I had pastoral gifts, and that they were stronger than those of the administration, so I slowly began to have more pastoral responsibilities. That made me feel more fully in the place since I was using my gifts in a better way. One way I could put into practice my pastoral gifts and the healing experienced in Caminemos Juntos as a second generation of Latino immigrants was through the New Generation initiative which allowed me to serve the Movement's Youth. I am currently a Lay Pastor, and in my role as a catechist I have been able to represent, serve and support the second generation of immigrants and their families, I am learning a lot about how to be a Pastor and what It means to lead a church. Being part of a global family today, where we encourage each other. The simple fact of being together increases my faith and allows me to see how others also love this family. Also, I feel that I can identify myself and be Hispanic or American in Caminemos Juntos, in a way that can not be done in the other communities in which I am a part. In turn, I have loved to serve in El Puente Church and the new lay ministers there, knowing that we are in the same effort, and although we are far away, we have the same mission and identity as Latino Christians. The lack of leaders and resources. The harvest is great and the workers are few, there is always a need for volunteers and also for people who want to do the work full time, because the congregations and their needs are always many. It has been difficult to not be able to support the churches at a higher level as a result of this. How do you link your career and your service here in your mission and purpose? I feel happy because my current career and my ministry are the same. I have studied the Bible and theology in English, specifically the doctrinal part, and also the early Church. All the studies that I have received are very good, in solid and prestigious schools, but everything has been in English, and I think a part of my mission is to bring wisdom and understanding to a population that does not have access to this type of education. And what I am learning is how to communicate it in a way that can be beneficial for them. In turn, the Anglo-American church can also receive and adopt the virtues and values of the Latino church, and that is something that I can transmit to them and help them to see, thus having a part in this exchange and cultural enrichment. I would like to support the pastors of the churches that are part of Caminemos Juntos and be able to train, teach, pastor and serve them in whatever way they need. I would like to build a strong ministry for Hispanic youth so that they can develop their faith and find their vocation. Help them to enter more and more into that identity that they have as Latino Americans. What do you dream for Caminemos Juntos? More and more churches, workers and workers for the growth of the kingdom of God. During my last year at Wheaton College, I went with my friend Zach Stallard to a church fair at the university, and there we met Pastor Jonathan Kindberg and heard from Greenhouse and Church of the Resurrection, he gave us a file to apply for a internship, and Zach decided to do it. After my friend was accepted and began to serve there, I was able to learn more about these ministries and after a while Pastor Jonathan offered me to be officially involved and do an intership as well. The opportunity to serve Latinos through the church. And to be able to integrate my passions, desires and gifts, with my love for Christ, his church, and the Latino people. My role started as "Community Health Evangelism Intern", with the Latino or Spanish-speaking churches in Chicago and suburbs, which at that time were 6 (from Greenhouse), but mainly with New Generation in Church of the Resurrection. I helped to establish a health culture focused on holistic medicine, integrating spirit, mind, soul and body. One way to do this was through the coordination of two health fairs where people could be educated, take cholesterol and sugar tests, be measured and weighed , have their stress levels evaluated, etc. At the same time, I was supporting the women's ministry, doing Bible study and zumba classes, and I also collaborated with the children's ministry and the worship team. Another area in which I was involved was Instituto San Pablo, it was a local training for the ministry that took place every one or two months. After all this I had a break of almost two years, to go to nursing school, and later I gradually returned to collaborate in whatever was necessary, until my current role as Treasurer and Coordinator of Special Events was defined. To have a community of people who are in a similar walk to mine, and who move towards similar destinations. In addition, being part of a global Latino family through Caminemos Juntos, and knowing that I have brothers and sisters around the world. To find our voice as Caminemos Juntos and be able to be seen and heard. How do you link your nursing career and your service here in your mission and purpose? I serve Latino people in my work as a nurse, and I have the language and understanding to interact with them from my Christian heart, I see this as a clear fruit of being part of Caminemos Juntos, and of the growth that I have experienced here. I want to continue with the roles I have now; and also to be able to support with new knowledge through my doctorate, to continue creating culture and systems for the implementation of holistic health. In turn, I want to be an instrument that helps create young Latino leaders. May we grow as a movement, not only outward but also inward, to raise up Latino leaders who can impact the global church. The ninth edition of the Caminemos Juntos North America conference was held from August 2 to 4. Seventy latino leaders met every day at the Missio Dei Church in Houston, Texas, to praise God, grow as a community and build relationships as Anglican latino churches and leaders in the United States, Canada and Mexico under the theme: "Restored in Christ with Joy for the mission." This has been a particularly difficult year for the immigrant community in the US and part of the intention of the conference was to provide a healing space in which to be restored and renewed. Adults together with the youth (who had a seperate track) came together to grow and live into the reality of together being the body of Christ. Leaders came from cities such as Kansas City, Dallas, New Braunfels, San Antonio, Missouri, Santa Rosa (California), El Paso, Chicago and Forth Worth, and of course Houston, to this event which also included guests from Brazil, and Chile. Mark Ball, rector of Missio Dei the host church, his wife Jessalyn, the pastoral team of that congregation, and the coordinators of the event, Mimi Guiracocha, Eddy Dávila, Víctor Manieri and María Catalán, along with their planning team, made an effort so that this event could be developed day by day, from the activities on the stage, to the meals and / or cleanliness of the place, and their assistants could enjoy the blessings of it. It is the ninth year for this movement which is led by a team of directors which include Archbishop Tito Zavala, Archbishop Miguel Uchoa, Canon William Beasley and Rev. Jonathan Kindberg. Familia is a key value within latino cultures and for Caminemos Juntos. Plenaries, Bible studies, times of worship, workshops, meals and prayer times, all are aimed at making of Caminemos Juntos a family gathering, where each attendee can experience what it means to be part of a Church that transcends borders, languages, cultures and styles, and is united in Jesus. Workshops took place under topics such as "Equipped to Heal", "Bible Telling", "Disciple-Making Movements", and "Community Restoration." Attendees were also encouraged by hearing a report on the growing revival within the Anglican Church in Brazil given by Archbishop Miguel. Keynote speakers included Paco Amador and Chris Ophus, leaders from Chicagoland who are students and practitioners of DMM (disciple-making movements) in the Latino context. The bishop of the Western Gulf Coast Diocese, Clark Lowenfield, in the closing Eucharist gave an inspiring message to each of the attendees on the need for holiness as a pre-requisite for corporate revival. The closing of this ninth edition of the conference ended with joy, happiness and energy to continue day by day in the mission that God has given us, this was clearly reflected through the young people, who at the end of the activities went to serve at the Houston Food Bank to help those who need it most. The recharged and inspired hearts are now getting ready for the next Caminemos Juntos North America, which will be held in 2019 and in which a decade of ministry and familia will be celebrated. Susana Naso, from Santiago, Chile, is a journalist in background and currently a Caminemos Juntos missionary serving in Chicago. The ceremony will be broadcast live on Facebook Live from the Saint Paul's Cathedral Valparaíso, temple that celebrates 160 years of history since its construction. 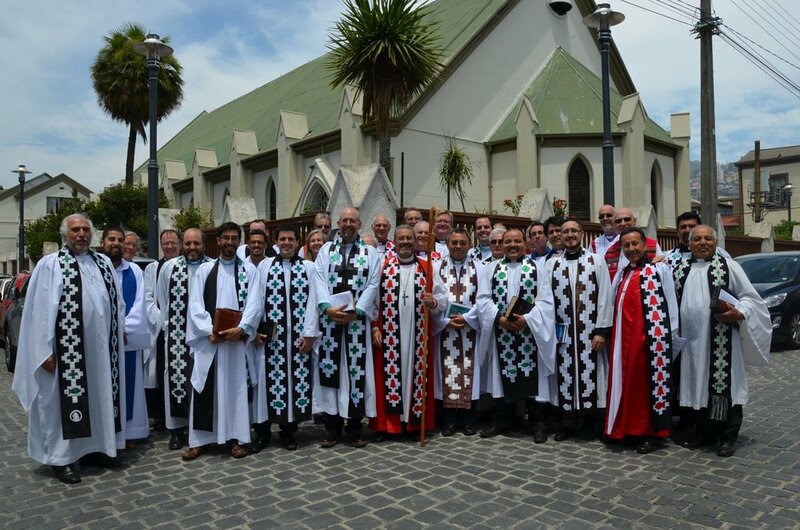 Next Sunday, July 15 at 11:00 a.m., the Ceremony of Consecration and Recognition of Diocesan Bishops of the Anglican Church of Chile will be held. The celebration will take place at the Anglican St. Paul's Cathedral Valparaíso and will be streamed live through its official Facebook page. At the ceremony, it will also take place the celebration of 160 years since the construction of the temple of Saint Paul's of Valparaiso, which has been declared a Historical Monument and has an important heritage value for the city and the Church in Chile. At the moment, the Anglican Church of Chile is a diocese that counts on 95 congregations and belongs to South America, but with the aim of promoting its growth and mission, expects to become an independent Anglican Province, territory that would be conformed by four dioceses, which will be administered by four diocesan bishops. The priests who will be consecrated by laying on hands are the reverends Samuel Morrison for the Diocese of Valparaíso and Enrique Lago for the Diocese of Concepción. While Bishop Abelino Apeleo will be recognized to lead the Diocese of Temuco. In the case of the Diocese of Santiago, the territory will be administered by the current Diocesan Bishop, Rv. Héctor Zavala, who will also be the Primate of the new Anglican Province of Chile. It is worth mentioning that the bishops were elected in May by an extraordinary Synod. On this occasion, the Chilean diocese approved the constitution and canons that it would adopt if obtained the approval to become a province. These decisions were ratified later in the month of April by the college of bishops of the Province of South America, during a meeting in Lima-Peru and were informed in an official announcement by the Primate, Archbishop Greg Venables. Hong Kong, whose mission will be to determine if the proposed new province meets the requirements to be an Anglican province. Leaders from eight congregations from four Provinces (Buenos Aires, Cordoba, Santa Fe and Salta) gathered together from May 31 to June 2, 2018 in Buenos Aires, Argentina, for the fifth annual Caminemos Juntos conference in Latin America. The event took place at the Church of San Pedro (Flores) and the Church of San Salvador (Belgrano). The regional event featured the Primate Bishop Greg Venables (who opened the conference and offered a closing benediction), one of the directors of Caminemos Juntos, Jonathan Kindberg from the United States, and United Adoration, a movement of musicians committed to creating new worship songs for the Anglican Church. The conference also featured several workshops and group discussions centered on the building up and strengthening of the growing church. It had been too long since the different Anglican churches of Argentina had met! 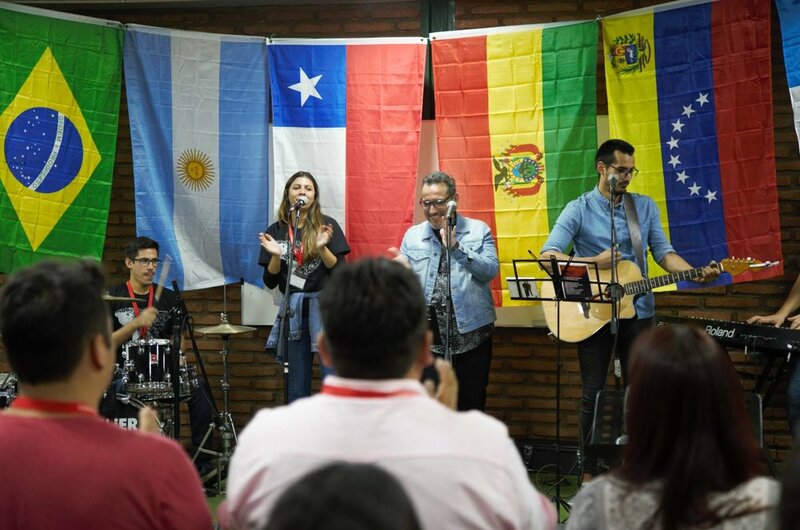 It was good to see the Argentinian church mobilized in this way: sharing, enjoying fellowship, worshipping, and praying together, while serving the Lord seeking new directions at this time in the country. Six representatives from the new GAFCON Province in Brazil attended (Arlinda, Karyna and Thais Souza, Patrícia Neves, Priscila Carriço and Marcos Antônio), along with Pastor Cristóbal Cerón from Chile, and Pastors Justin Clifton and Sergio Villanueva from the United States, leaders of United Adoration. Those from Brazil shared their experiences living through the current revival of the Anglican Church in Brazil, and the importance of discipleship, evangelism, intercession, and worship for revival. At the conference, we prayed for the multiplication of churches, passion and love for the lost in our communities, and for the spreading of the Word of God in schools, at work, and other community centers. We received excellent teachings, and took time to listen to what God was sharing with us and to what he was calling us and our churches. It was clear: Spread the gospel to the four corners of the world! Now is the time! The Holy Spirit launched us into our mission in South America. Now we all must roll up our sleeves, and take the first steps so that we may continue walking together, following the direction of the Lord. Leaders from 10 congregations gathered this past weekend, May 24-27th, at Iglesia del Gran Pastor in Fresnillo, Zacatecas in Central Mexico for the fourth annual Caminemos Juntos conference. The purpose of this gathering was to mobilize leaders for the planting of Anglican churches throughout Mexico and to provide a space for new congregations and leaders that are exploring joining the existing group of ACNA churches. Present were 4 missionaries from the new GAFCON Province in Brazil including missionary Bishop Flavio Adair Suarez who was the keynote speaker and presented lessons learned from the growth of the church in Brazil through multiplication and disciple making. Others shared on the intercessory and women's ministries which have played a key role in Brazil. On Sunday, the final day of the conference, Farhid Adabache of Iglesia del Gran Pastor, was ordained as a deacon by Bishop Mark Zimmerman of the ACNA Diocese of the Southwest with includes the Mexico deanery of congregations. This was an historic occasion marking the first ACNA leader ordained in Mexico. Deacons Farhid and Eduardo Gonzalez ,who serves in Ciudad Juarez on the border with El Paso, Texas will both represent Mexico at the upcoming GAFCON conference in Jerusalem later this summer. Caminemos Juntos is the GAFCON network for Mexico and Latin America. This year in addition to hosting this regional gathering in Mexico, Caminemos Juntos is also hosting conferences in the US and Argentina. Click here (https://www.gafcon.org/news/lets-walk-together-the-history-of-a-new-church-planting-movement-in-latin-america) to read more on the history of Anglican realignment in Mexico and Latin America. Gathered around the dinner table in a Chicago home were young people from Venezuela, Mexico, Chile, Brazil and the US. Over dinner Arlinda Sá Souza shared the story of dream she had had over thirty years ago as a new Christian in Brazil. This dream began an over thirty-year process of preparing to answer the call that call to Nazaré, a journey that led Arlinda, her husband Bruno and daughter Thais to that dinner table in Chicago that day. 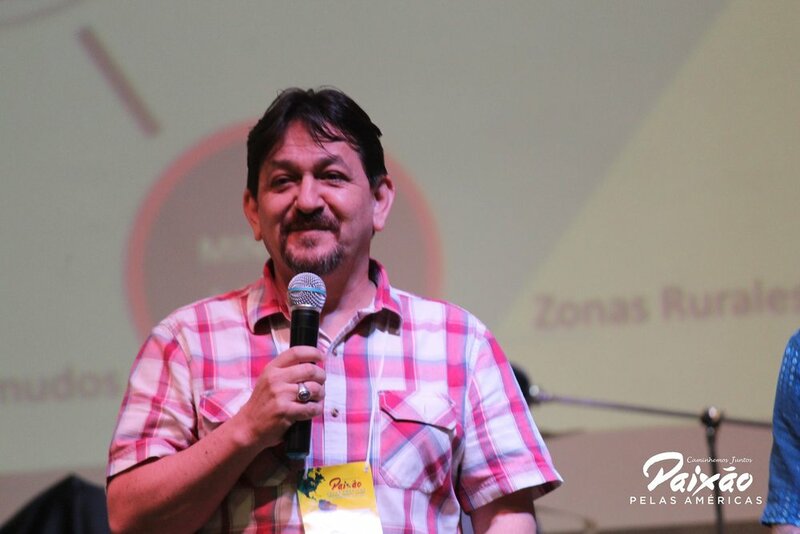 In October of last year Caminemos Juntos* held it’s annual conference for the Americas in Recife, Brazil with theme of global mission and with the purpose of equipping the Anglican Church in Latin America to send missionaries and church planters the world. Bruno and Arlinda Souza from the diocese of Recife (now soon to be a GAFCON province in Brazil) attended the conference and shared about their calling to Portugal and how they’d been waiting for the church to send them and the Lord’s timing to go. They were invited to apply to become missionaries with the Greenhouse Movement (the mission society that facilitates the Caminemos Juntos conferences) and then to attend Greenhouse’s weeklong missionary training held in Chicago, USA after which they spent 10 additional days on mission amongst the Mexican immigrant community in that city. Their hope is to be sent to Portugal in January of 2019 as the new Province of Brazil’s first global missionaries and to eventually serve locally under Bishop Andy Lines, the GAFCON bishop for Europe. Brazilians, in partnership with US-Americans, being sent to plant a church in Portugal, under an English Bishop (who himself had been a missionary in Paraguay). This is the exciting, and at times mind-boggling, new face of global Anglican mission. This is a mission that is polycentric. In other words it is no longer simply “from the west, to the rest” but rather from “everywhere to everywhere,” to use the language of the Lausanne Movement. It is also highly multicultural. The global mission teams of the future will involve two, three or four nationalities working in an again altogether different local cultural context made up also of many different cultures. For example, a mission team might involve Brazilians, Kenyans and Australians reaching North African Muslim immigrants in Spain. This new global mission also involves deep partnerships between the Church in the Global North and Global South. The Global North has a long history of global sending and financial resources and structures setup to do so, but increasingly face a shortage of missionary candidates. Many areas of the Global South, such as the Church in Brazil, are at the same time experiencing revival and expansion and are overflowing with willing and able candidate, though as a Church have less experience, financial resources and structures setup for global sending. Finally, the global mission of the future takes into account the reality of global diaspora. Today we are experiencing the greatest movement of peoples the world has ever seen. This presents an amazingly unique missional opportunity that may be missed if the Church succumbs to nationalistic and ethnocentric political currents. Please pray for Bruno, Arlinda and Thais and for a whole new Spirit-empowered wave of Anglican missionaries for Europe and the ends of the earth. *Caminemos Juntos, which means “Let’s Walk Together” in Spanish, is the GAFCON network for Latin America and is led by Bp. Tito Zavala, Bp. Miguel Uchoa, Cn William Beasley and Rev. Jonathan Kindberg. These leaders, among others, will be helping to lead the Global Mission Network sessions of the GAFCON conference in Jerusalem this June. 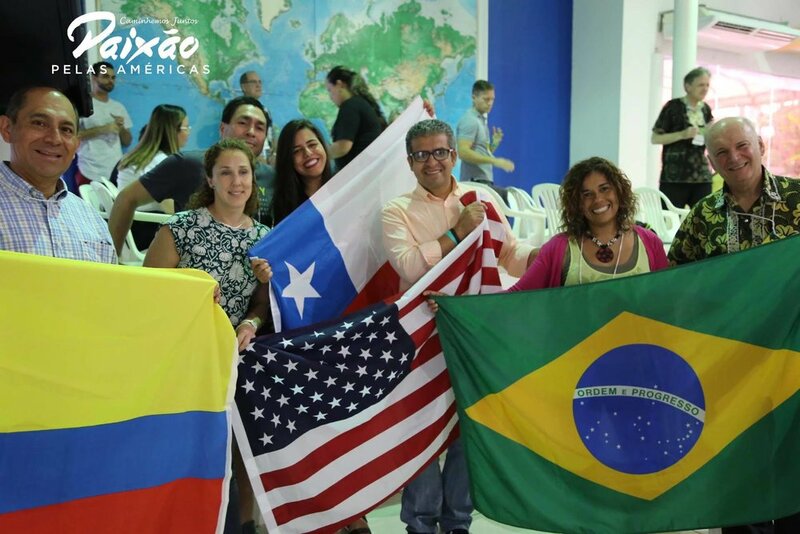 “Passion for the Americas” was the theme of the Caminemos Juntos 2017 conference, a conference with more than 200 Anglican representatives from North, Central and South America held in Recife, Brazil, with the goal of catalyzing mission and church planting throughout the continent. 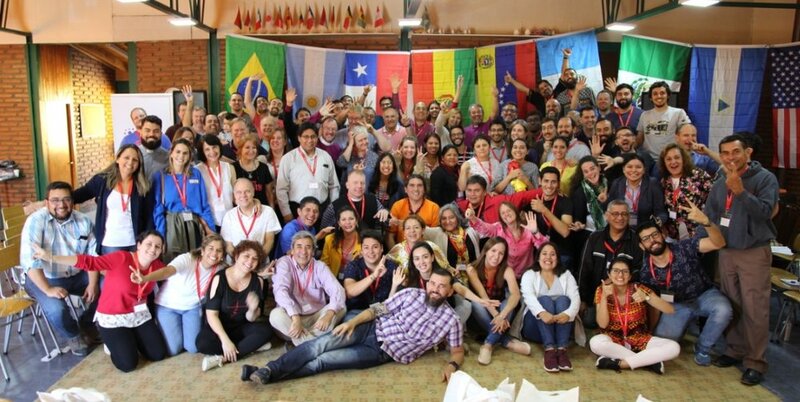 This second annual gathering of Caminemos Juntos in South America brought clergy and a diversity of lay leadersfrom more than 9 countries together. The three themes of the conference were: Mobilizing, Equipping, and Planting, in order to walk together as the Anglican Church in the Americas. The conference was organized by the Greenhouse Movement, the ACNA, the Diocese of Recife in Brazil, the Anglican Church in Chile, and GAFCON. It is important to note that this year’s gathering included a visit from Charles Raven, Secretary of Membership Development for GAFCON, who shared about the Anglican movement worldwide. 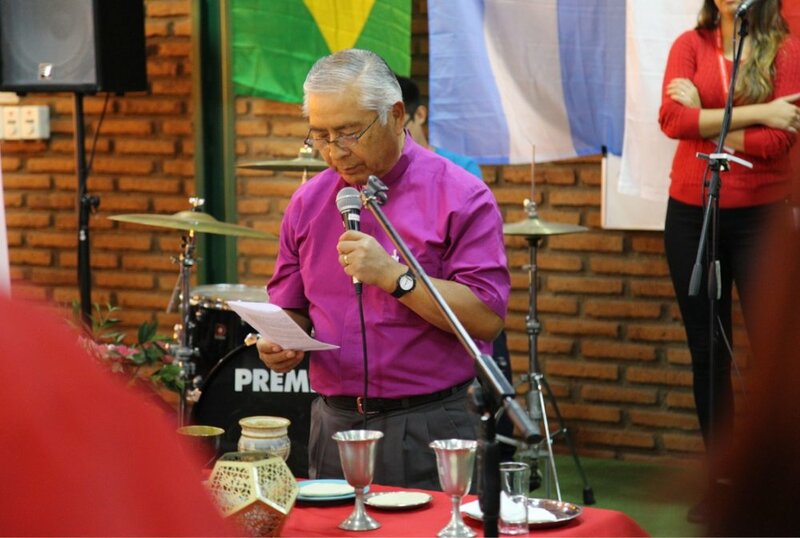 The three day gathering was hosted by Parróquia Anglicana Espíritu Santo (PAES), the largest anglican church in Latin America, with more than three thousand members. The program was comprised of plenaries, workshops, and small working groups, along with a special worship and prayer night on Thursday, which was attended by more than 800 people. For the first time this year, there were pre-conference equipping sessions 2 days prior to the main conference gathering. One of the workshops was led by MOCLAM and was focused on teaching the panorama of scripture from Genesis to Revelation. Similarly, there was a training for those interested in becoming church planters and global missionaries sent out from Latin America. Caminemos Juntos' worship movement, United Adoration led a retreat for songwriters where new songs were written and then sung throughout the conference. You can listen to one here. Rev. Jonathan Kindberg, co-director of Caminemos Juntos, said that having the conference in Brazil was key as participants were able to experience first hand the spontaneous growth and revival being lived out in Brazil, a dynamic similar to what happened in the Anglican church in East Africa. This fire and passion that God is awakening is not only for Brazil but is spreading throughout Americas. The first day focused on Mobilization. The focus was how to mobilize the Latin American church on global mission. One of the key questions was: “How can the Anglican Church in Latin America shift from being a mission field that simply receives missionaires to being a church that sends missionaries throughout the world?” The day began with a talk by Carlos Scott, former president of COMIBAM (a consortium of Latin American mission and sending agencies) and the current facilitator of an organization called Misión Glocal (Glocal Mission) in Argentina. In his presentation, Scott described the evolution of the Latin American missionary movement in recent years and how we are experiencing an enormous paradigm shift in how mission is seen and practiced. As Scott emphasized, if at the end of the 90’s there were four thousand missionaries, today Latin America has a total of twenty five thousand missionaries both in Latin America and being sent from Latin America throughout the world. He said there is a growing missionary expansion and that the Church in Latin America is beginning to understand its purpose of extending the Kingdom of God to all nations. This first day of the conference also included a talk by Filipe Santos, mission pastor of City Church in Sao Paulo, the largest Baptist church in Brazil, who spoke on how to develop a church culture that values mobilization in order to creatively reach the key cities of the world. Participants once again were not only able to hear about examples, but got to experience this kind of creative mobilization first hand by visiting congregations throughout the Diocese of Recife, which since separating from the Episcopal Church in 2005, has planted more than 30 churches in only 12 years, thanks to missional strategies such as Casas de Paz (“Houses of Peace”) and is on it's way to becoming a province. As Bishop Miguel Uchoa explained, “Houses of Peace is a lay-led initiative and evangelistic tool to enter non-Christian homes and has led to the planting of new congregations... and the mobilization of the entire church.” Some of the other innovative missional initiatives of the diocese are: social ministries aimed at reaching the poor and marginalized like House of Hope, church-based outreach Karate classes, the planting of congregations inside prisons and an evangelistic marriage ministry and video curriculum for couples which has millions of hits on youtube (see here). A second focus of the conference was “passion for equipping.” One of the sessions this second day of the conference was led by a team from Chile. Diocesan Bishop Héctor (Tito) Zavala spoke about “passion for formation,” and how this has facilitated the ongoing growth and maturity of the Chilean Anglican Church. On this same topic, some of the leaders from Chile spoke aboutthe Center for Pastoral Studies (CEP), the Chilean Anglican seminary which started in 2003, and also about other Chilean equipping initiatives for leaders, which have led to the planting of 19 churches and the ordination of almost 50 clergy in the past 17 years. Along these same lines, the importance of being able to share equipping resources between the different countries in the Americas thanks to Caminemos Juntos was highlighted. One example of this is the exchange that has taken place between Mexico and Chile. Chile this last year brought their highly successful Anglican Marriage Encounter program (EMA) to the fledging ACNA deanery of churches in Mexico. Also this last year a leader from the Chilean seminary came to the church of Iglesia del Gran pastor in Fresnillo, Mexico to do a week long intensive course on Anglican Mission and Identity. “The Anglican church in Mexico today is weak in terms of equipping and these kinds of exchanges greatly motivate us because without formation there is no vision” said Juan Manuel Herrera, one of the lay ministers of Gran Pastor, one of the larger ACNA churches in Mexico. The Greenhouse Movement (known as Sociedad Misionera San Pablo in Latin America) presented on the third focus of the conference: “passion for church planting.” Greenhouse’s Missioner General, William Beasley, along with Bishops Marcio Meira and Flavio Soares of Brazil, spoke on the work of lay church planting both in the US and in Brazil. The Greenhouse Movement has been deeply shaped by Anglican Church in East Africa which has also experienced explosive growth thanks to the move of God through lay leaders. William Beasley explained that we are seeing God pour out this same fire of revival in Latin America. While holding firm to the gospel and the historic roots of Anglicanism, lay leaders throughout the Americas are engaged in a creative missional effort that opens the door for the spontaneous expansion of the church that is able to reach all kinds of cultures and communities. One of the main emphases during the conference was that the Global Anglican Church is currently in the midst of twin reformation: a doctrinal reformation and a missional reformation. Charles Raven, who led a workshop on this very topic, explained that this year, as the Church celebrates the 500th year since the Protestant Reformation, we have come to grips with the fact that we are not simply celebrating a historical event. The Church has always been and is always reforming. Today, we are working to recover and restore the truth of the Gospel. It is this Gospel of grace rooted in the Bible that ultimately drives us to fulfill the Great Commission. "We are continuing to work alongside GAFCON to expand our network to share resources and training in all 35 countries of the Americas and the Caribbean. We are striving towards mission centered unity, while also holding firmly to our biblical foundations, knowing that it will result in the formation of new Anglican church plants all across the Americas and throughout the world." We expect that this vision will continue to spread, and, at our next conference in Chile (Oct 4-6, 2018), we hope to witness even more countries walking together under the same vision and passion of reaching all the Americas with the love of Christ. While the Canterbury Primates Meeting was taking place earlier this month with its heavily contrived ‘Walking Together’ theme, despite the principled absence of Primates representing some 30 million Anglicans, a very different ‘Walking Together’ was being practiced by Anglicans meeting in Brazil. Caminemos Juntos, which in Spanish means ‘Let's Walk Together’, is an Anglican Latino mission and church planting initiative for the whole of South, Central and North America. Its leadership team includes Bishop Tito Zavala of the Diocese of Chile with its coastline of over 2,600 miles, Bishop Miguel Uchoa of the Anglican Diocese of Recife which covers an area about the size of Western Europe in the north east of Brazil as well as leaders from the ACNA in North America Canon William Beasley and Rev. Jonathan Kindberg. I was recently privileged to attend their annual conference in Recife from 5th-7th October along with some one hundred and fifty delegates from ten different nations. It was a wonderful reminder that though the traditional leadership of the Communion is losing the gospel for the sake of institutional compromise, here are people who are willing to lose their lives for the sake of the gospel. The Canterbury version of ‘Walking Together’ is energised not by mission, but by church politics. It is quite obvious that the primary concern is inward looking. Essentially, the preoccupation of successive Archbishops of Canterbury since 1998 has been how to somehow contain orthodox Anglicans in the same global institutions as those who steadfastly reject orthodox faith and substitute their own ideas for the Bible’s teaching, most obviously on sin, sexuality and marriage. In contrast, Caminemos Juntos is outward looking. The conference venue itself symbolized the vitality and vision of the movement. We were hosted by the Anglican Parish of Espiritu Santo (Holy Spirit), founded by Bishop Miguel in 2006 in a building which had previously been known as ‘Babylon’, one of Recife’s leading night clubs, and has now grown to some 3,000 members. Caminemos Juntos as a whole is energised by this passion to serve and reach the lost for whom Christ died. New churches are being planted throughout the Americas, new missionary dioceses are being created and there is even a successful Chilean mission in India with a missionary partnership between Recife and an African diocese being planned. The biblical principles which Gafcon stands for have played a key role in the Caminemos Juntos story. The Diocese of Recife, now led by Bishop Miguel, was expelled from the Anglican Episcopal Church of Brazil (IEAB) in 2005 because it adhered to Lambeth Resolution I.10 which affirmed that homosexual practice was contrary to Scripture and would not continue in communion with the American Episcopal Church (TEC) which had rejected that teaching and adopted a liberal and revisionist theology. At the time, Archbishop Gregory Venables of the Anglican Church of South America (then known as the Southern Cone), intervened and granted recognition and licenses to the bishop of Recife and his clergy and in so doing demonstrated what true ‘Walking Together’ should look like when the gospel is threatened. The Diocese of Recife is now recognised directly by the Gafcon Primates Council and it has authorised Bishop Miguel to establish episcopcal oversight of ‘existing and potential’ churches in Central America and those parts of northern South America also in TEC aligned Provinces. This work is starting to bear fruit and it was a great joy to meet faithful Anglican clergy from these areas who now have somewhere to belong. A similar process is underway as well in Mexico as the ACNA has decided to offer oversight for leaders in that country who cannot in good conscience work with the Anglican Province of Mexico which is, unfortunately, theologically and financially tied to the Episcopal Church of the US (TEC). Caminemos Juntos is a wonderful example of the vision of Gafcon in practice. It demonstrates the great purpose set out in the Jerusalem Statement and Declaration 2008, namely ‘to free our churches for a clear and certain witness to Jesus Christ’. At the heart of the Gafcon movement is a vision for the Anglican Communion to be an effective means of reaching people for Christ worldwide. True ‘Walking Together’ will, where necessary, create new structures to serve the gospel. It will not be distracted by a false ‘Walking Together’ which tries to change the gospel to serve old structures. We Pray Your Kingdom Come! / Venga Tu Reino! “Let every nation gather with praise. With one loud voice the attendees at the Anglican Church in North America’s Provincial Assembly sang the lines of this newly written song symbolizing much of what God did during the conference in bringing the nations together for the sake of mission in a fresh way. Over 1400 attendees from 30 countries gathered outside Chicago in Wheaton, IL June 28th-30th for the ACNA’s every three year gathering of the whole North American church. This year’s theme was “Mission On Our Doorstep: Local Mission, Global Family, Shared Gospel”. The conference highlighted the missional opportunities right in front of us and how the Global Church can help us reach the nations here in North America. It truly was a historic gathering which included the consecration of a GAFCON missionary bishop to Europe, Andy Lines (who notably served for a season as a missionary in Latin America and speaks Spanish). This year Caminemos Juntos, rather than hosting a separate conference, integrated it’s 7th annual North American conference as part of the overall Assembly, both leading a sub-track within the conference in Spanish and assisting in the overall planning of the event so that Latino attendees would feel welcomed and at home. This an amazing opportunity to share testimony to the larger North American Church of what God is doing within and through the Latino community. Also, it gave the opportunity for the Caminemos Juntos attendees to experience and build relationships with leaders from the broader church after 6 years of stand alone conferences. The CJ sub-track aspect of the assembly included times of worship in Spanish and both Spanish and English language workshops around themes such as a Biblical understanding of immigration, how to start church-based immigrant legal aid centers, the unique challenges faced by second generation Latinos, and pastoral counseling. Archbishop Venables of the Province of South America and Archbishop-emeritus Tito Zavala from Chile were interviewed by Canon William Beasley in one of the sessions at the end of which they both kneeled as participants laid hands and prayed for their perspective ministries and the ongoing mission and work in South America. No longer is mission “from the west to the rest” but rather “mission from everywhere to everywhere,” this concept and the second phrase in particular was repeated over and over by different speakers throughout the Assembly. Archbishop Tito Zavala was one of the speakers who brought this up as he spoke on Jonah as an example of “anti-mission on your doorstep.” Examples of this reality were reciprocal mission testimonies shared by both Kenyan and Chilean missionaries reaching African-Americans and Latinos in the US, respectively. Maria Jose Yunis, a young twenty-something Chilean missionary serving in Virginia, US shared about reaching young Central American immigrants, many of whom came to the US as unaccompanied minors. There was a living out of this reciprocal mission reality immediately leading up to the Assembly as leaders from the Anglican Church in Brazil, Myanmar and Chile met with congregations-in-formation from their respective cultural groups in the Chicagoland area, a city made up of immigrants from the nations. These church leaders from around the world who were attending the Assembly weren’t just here as guests but to truly do “mission on our doorstep” in helping reach the nations here in the US. By far this was the most multi-ethnic and multi-cultural ACNA event to date. Caminemos Juntos, Jubilee (Greenhouse’s African-American church network), AMMiC (Asian and Multicultural Ministries in Canada) and AMEN (Anglican Multi-Ethnic Network) each led sub-tracks around multicultural and multiethnic ministry issues and challenges. It was also clear that much intentionality was given to highlight these different cultural expressions in the overall Assembly sessions and to make attendees from a variety of backgrounds feel welcome. Wednesday evening’s plenary featured a highly respected Chicago based gospel choir and there were testimonies by local African-American leaders. Thursday evening’s plenary session (which can be watched here) highlighted the work of Caminemos Juntos and featured music in English and Spanish and prayers in English, Spanish and Portuguese. A creative Salsa scripture presentation and dance that was part of one of Chicago’s Easter Vigil services in Holy Week this year was also part of the evening. All plenary sessions were also simultaneously translated into Spanish. A unique aspect of this year’s Provincial Assembly was the role of songwriting and worship. Passionate and powerful worship blending both traditional and contemporary styles marked each of the sessions. For the first time, United Adoration a songwriting and worship movement, gathered songwriters from throughout North America and led a songwriters retreat the day before the Assembly. One of the song’s that was written was a bilingual song (We Pray Your Kingdom Come/ Venga Tu Reino) that was then immediately taught and sung during one of the plenary sessions with the aim that then leaders would take this song back to their local congregations. (The song can be heard here and the chords/lyrics found here). The writers and composers put in words and melody, in a remarkable way, the spirit and focus of the Assembly. Halfway through the first line the whole gathered body was singing it as if they’d known it for years. This brought breath of creativity and freshness to the whole Assembly which included a significant amount of time focused on Spirit-filled musical worship. Throughout church history revivals have gone hand in hand with new songs and an overall renewal of worship. A similar dynamic was evident at the Assembly. Para cumplir hasta el fin Tu misión: Venga Tu Reino"
At the final closing Eucharist not only was Bishop Andy Lines consecrated and commissioned for mission in Europe, but everyone at the Assembly was commissioned to go out on mission and put in practice what was experienced in the Assembly. After a brief commissioning liturgy everyone was invited to come forward to be prayed for, anointed and commissioned by one of the bishops present to go out on mission in the power of Christ’s name. During a time of testimonies and evaluation after the week of Caminemos Juntos events, leader after leader shared similar comments. Many were deeply touched by the commissioning service in which leaders were sent out to plant churches through a foot washing service. In a context often marked by authoritarian leaders, having their feet washed by their bishop and clergy brought tears and deep healing. Over 50 leaders from 3 countries (Brazil, Chile, USA), 10 denominations and at least 5 states within Mexico gathered for the third annual Caminemos Juntos: México conference in Fresnillo, Zacatecas. This year in addition to the usual 2-day conference with workshops and plenaries there was a 4-day intensive leadership training session on Anglican Identity and Mission. Jonathan Kindberg the dean for the Mexico deanery of the Diocese of the Southwest, team taught the training along with Chilean missionary Christian Zúñiga (who is planting a church in New Braunfels, Texas) and Pablo Zavala, brother of Archbishop Tito Zavala and president of the committee which oversees the Anglican seminary in Chile. Bishop Mark Zimmerman, bishop of the ACNA diocese of the Southwest of which the Mexican congregations are a part, brought the week to a close preaching on the Ascended Christ and baptizing 3 children as part of the Sunday service at Iglesia del Gran Pastor. A highlight this year was the participation of both students and professors from the All Nations (Todas Las Naciones) Seminary in Ciudad Juarez. This seminary is beginning to partner with the ACNA in planting churches and reaching the 120 million residents of Mexico. Plans are underway for new churches and the raising up of new leaders in Juarez and other cities throughout Mexico as small steps are taken towards becoming it’s own diocese. In the parable of the Sheep and the Goats in Matthew 25, Jesus says to those on his right side, “I was a stranger and you welcomed me.” Have you ever experienced what it’s like to be welcomed as a stranger? Early in our marriage my husband and I had such an experience when we spent six months living and working in China as Christian professionals. We couldn’t speak or even read the Chinese. We had no idea how to get from place to place. In fact, when we first arrived we just stayed in our apartment because we were afraid that if we left we might never find our way back! A few kind Chinese friends helped us get oriented and introduced us to others who made us feel welcomed and gave us the confidence we needed to thrive in China. After that experience we were resolute: when we got home we would be people who heeded Jesus’ command to welcome the stranger. Much has happened since that time, but our call to welcome the stranger never waned. Three-and-a-half years ago the Holy Spirit led us to plant a church in our multi-ethic neighborhood in South Bend, Indiana. For the last 20 years, our neighborhood was the refugee resettlement neighborhood in South Bend. Our neighbors originate from dozens of countries from Africa, the Middle East and East Asia, not to mention Latin America. Many of our neighbors come from Muslim backgrounds. As we prayed about this reality, the Lord showed us that our call was not simply to evangelize an American neighborhood, but to extend the welcome of Christ to the immigrants and refugees among us. We started by simply inviting all these different peoples into our fellowship at Tree of Life. We had several Liberian refugees join our church and were thrilled to have a few Muslim women attend an Alpha Course we held in an apartment complex. As we walked with these dear people, we began to learn about the many heartaches and obstacles they were facing in America and as immigrants. One young Liberian man in our church revealed that one of his siblings had been left behind in Liberia and that no matter what they tried, without citizenship his family was unable to successfully petition for her to join them. It seemed obvious that we should help this good man gain his citizenship. So began a long process of reading government documents and making phone calls to a strange, but surprisingly friendly organization called USCIS. Finally, our brother became a US Citizen and was able to petition for his sister to unite with her family in America. So began our church’s journey to opening the first ever church based immigration legal aid clinic in the ACNA (several more are underway!). As it turns out the Board of Immigration Appeals (BIA) of the US Government has a program that authorizes equipped churches and non-profits to administer immigration legal-aid to low-income clients. As anyone who watches the news is fully aware, immigration ministry is in dire need throughout the world. In Europe waves of Middle Eastern immigrants are seeking Welcome. Here in the USA there are millions of legal immigrants who are under-resourced and don’t have access to legal help in navigating a confusing legal system. As politicians seek a solution, the main victims are often well-meaning immigrants and refugees who wish to live, work and be united with their families legally, but cannot understand the complexities of our immigration system or afford the legal representation they need. It’s time for the church to respond. Opening a low-cost immigration legal-aid center is an amazing way not only to give a cup of cold water to the strangers among us, but also to build deep and lasting relationships with immigrants. Since opening in March of this year, we have helped over 40 clients from more than a dozen countries. Each client comes with a unique story and set of circumstances; but all of them share a common desire: to belong. When they encounter the warmth and enthusiasm at our church, many are often quite taken aback. One woman actually said to me, “Up until now, I thought most Americans just wished I wasn't here, what makes you so different?” The answer: “When we were strangers, Jesus welcomed us. Now we welcome you.” Several of our clients from African Christian backgrounds have visited our church and a few clients from other religions have come to ask for prayer and pastoral counseling. We are thrilled to see how the Holy Spirit continues to use this practical ministry to make a way for immigrants not only as American residents, but also members of the Kingdom of God. Our hope is that our Legal Aid clinic is the first of many to begin around the country as part of the Anglican Immigrant Initiative of the ACNA. If you or your church is interested in learning more about starting an Immigration Legal Aid Clinic, please feel free to contact me at Tree of Life Anglican Church in South Bend or see the Anglican Immigrant Initiative’s website: www.anglicanimmigrantinitiative.com. Tree of Life also covets your prayers as we continue this ministry. As with any ministry, and because of our call to the poor and the immigrant, one of our greatest needs is financing. Please pray with us that the Lord will provide for the work He has called into being.